Go to Build A Bear Workshop, online at BuildaBear.com, to bring your favorite childhood friends to life. Build A Bear specializes in providing homes for a wide selection of adorable and cuddly teddy bears and furry friends like puppies, koalas, kitties, bunnies, zoo friends, and many more sweet and lovable creatures. Build a Bear has teddy bears of different colors and designs and offers a variety of clothing, shoes, and accessories for little bears. It's easy to create a little friend with care and a personal touch at Build a Bear, making BuildaBear.com a great place to shop and customize gifts for both kids and adults. Build a Bear also offers pre-made bears, seasonal gifts, Hello Kitty and Muppets brand friends like Kermit and Miss Piggy. But before you shop, be sure to gather all the latest BuildaBear.com discounts, Build a Bear promotions, and Build a Bear coupon codes, found here at RetailSteal.com. Build a Bear ships in the United States and internationally. Shipping rates are based on number of items and shipping method. Shipping charges for international orders do not include customs fees and taxes. See site for more information. Enjoy a $10 savings on any order of $40+ at BuildABear.com with this code. 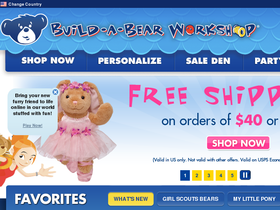 Enjoy 50% savings on clearance when you shop at Build A Bear Workshop. Click here to shop. Save $5 on any order of $50+ at BuildABear.com when you use this code at checkout. Head over to Build A Bear today and save 25% on Angry Birds Classic toys. Click to shop and save. Get a Hello Kitty friend for as low as $12 at Build A Bear. Click link to shop. Shop at Build A Bear and find Disney Princess Bears from $23. Click link to shop and save. Get a 15% discount on purchases from Stuffed Ark online when you enter our coupon code at checkout. Shop at Stuffed Ark and enjoy free shipping on orders $69+. Click here for code.